This Guidebook is intended to be a reference for survey practitioners looking for guidance on integrating soil health testing in household and farm surveys. The role of soil in agrarian societies is unquestionable, yet the complex nature of soil makes it much more challenging to measure than agricultural inputs such as fertilizers or pesticides. Historically, household surveys either include subjective questions of farmer assessment or rely on national-level soil maps to control for land quality, if anything at all. Recent scientific advances in laboratory soil analysis—via spectral soil testing—have opened the door to more rapid, cost-effective objective measurement of soil health in household surveys. 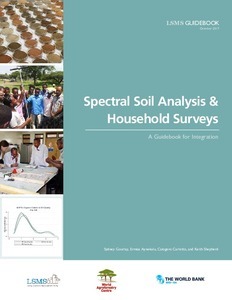 This Guidebook explores the nascent possibility of integrating plot-level soil testing in household surveys through a presentation of results comparing various soil assessment methods and a step-by-step guide for practical implementation. In partnership with the World Agroforestry Centre (ICRAF), the Living Standards Measurement Study of the World Bank’s Development Data Group set out to validate (1) the feasibility of implementing spectral soil analysis in household surveys, and (2) the value of subjective farmer assessments of soil quality compared with objective measures in order to determine the need for objective soil analysis, specifically in low-income, smallholder agricultural contexts. These objectives were met by implementing two methodological validation studies, one in Ethiopia and one in Uganda. In both studies, plot-level soil samples were collected following identical international best-practice field protocols and analyzed using wet chemistry and spectral analysis methods at ICRAF’s Soil-Plant Spectral Diagnostics Laboratory. Additionally, plot managers were administered a series of subjective questions that are often used to gauge soil health in national household surveys. These studies resulted in two uniquely rich datasets that allow for comparison of subjective indicators of soil quality against laboratory results. Both laboratory and subjective results can also be compared with publicly available geospatial data, as all plots were georeferenced.